Hello Flamingo! Simon Says Stamp Among the Stars release! 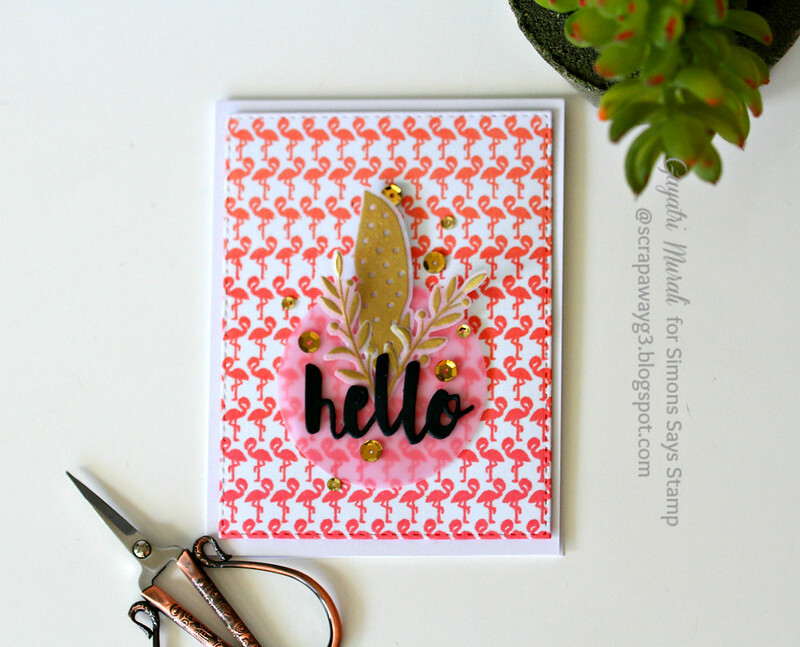 Hello everyone, I am sharing a card I made using the flamingo background stamp set from Among the Stars collection released by Simon Says Stamp. I love flamingos and they are trendy at the moment. I can see them everywhere. 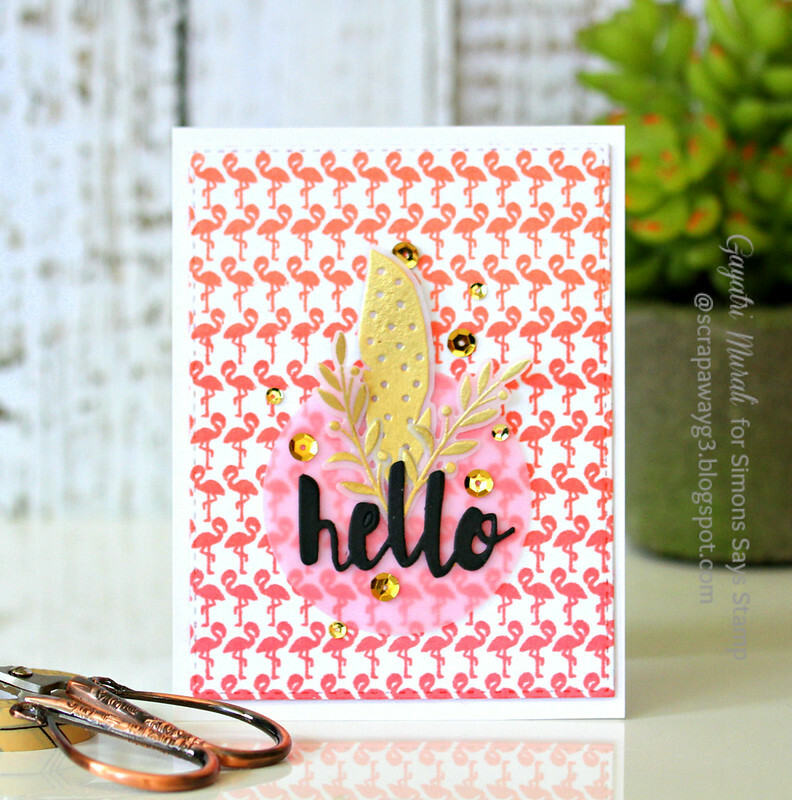 In the newly released collection there is a beautiful flamingo background stamp which I have used on my card. 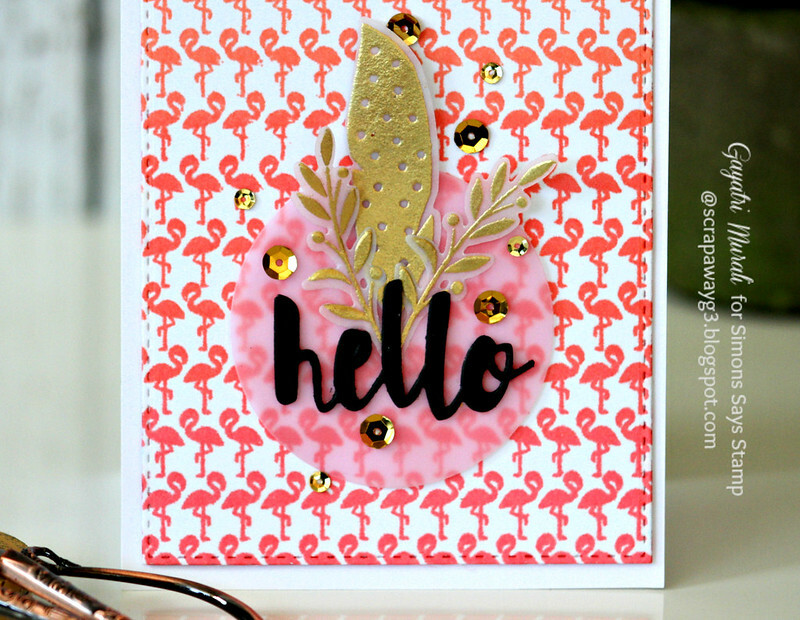 I wanted to see pink flamingos and so used Simon Says Stamp Teenie Bikini, Hero Arts Fresh Peach and Soft Cantaloupe ink in ombre to ink the stamp and stamp on Neenah Solar white cardstock panel. I used MISTI to stamp so I could double stamp to get even coverage. Then I used Simon Says Stamp largest Stitched Rectangle Die to die cut the stamped panel. For the focal point, I die cut a circle out of pink vellum paper. The sentiment is Painted Hello die from Simon Says Stamp which I die cut three time and stacked glued them for dimension. The feathers and twigs are from Oh Happy Day stamp set from Simon Says Stamp. I gold heat embossed them on vellum cardstock and die cut them out using coordinating dies. I them adhered these behind the Hello die cut sentiment which is adhered on the vellum circle and the whole cluster is adhered to the stamped panel using foam adhesives. Finally embellished with gold sequins from Little Things by Lucy Bright Copper collection. I absolutely love this stamp set. I made lots of background panels using various techniques using this background stamp. Hoping to use them and make more cards. Will share as soon as I make them. Hope you like this card. You can get all the new stamp set and dies from Among the Stars collection at Simon Says Stamp Store. WOW – that pink is the perfect colour ink for the background. Great card. Fabulous and so flamboyant with all that pink and gold – LOVE it! !